Never laid hands on one in real life, but I was playing around with it using the MESS emulator. It has a great BASIC, lots of neat things you can do with it. The game Traffic Jam is a blast, too. I've thought about trying to port it to either the Atari or the C64. Here is some more info on the system Tomy Tutor and the Tomy Tutor MKII. I used to own one and with US game releases. Sold to Lord Thag, and never looked back. Fun little rare computer. I considered porting my TI-99/4A homebrew version of Pitfall! to the Tutor. Then I thought who's gonna play it. There are no homebrew PCB's for that machine, so only emulator would be possible for now. I wonder how many Tutor machines there's still out in the wild. I have a near complete US Tomy Tutor collection and several Japanese games. It's an alright system (sort of reminds me of the TI or Colecovision) and the games look nice, but they play soooooo slowly. I haven't fired mine up in awhile, but it would be nice if someone could port Traffic Jam and Demon Diggers (well the Japanese version anyway) to the TI. I actually could have had one of these computers years ago at a yard sale, but had other computers already and didn't know what I was looking at. Had I known then what I know now.. I don't have one but around 1990 there were 10+ Tomy games ported to the Myarc Geneve 9640 (both have the TMS9995). I've played these ports on the Geneve and some are pretty fun and look fairly nice. I just added a Tomy Tutor to my collection. Only found 6 spiders all dried up inside. I hear up above, that there is no cart board for it? Is that still true? Anyone here put an F18A board in one? I have a couple Tutors. Haven't broken them out in years. I have the recorder, joy pads and a joystick as well and a reasonable collection of carts. It would be great if there was a megacart available. I've got a set of 7 carts on the way... I will need to build a joystick adapter. I'm tempted to pick up a recorder. I'm a little conflicted... Can it be used with a digital recorder? Once the F18A is in, I suspect the clock crystal can be switched up to 12Mhz, from the current 10. This is great. Please post what you come up with. I'm very interested. I spent a lot of time last night just staring at the motherboard. Like I did as a kid staring at the TI-99/4A when I first opened it up. The site you mention is the only one I've ever really found. I have the manual that came with the computer but it's cheesy at best. Wouldn't it be neat if the damn thing could be coupled to a peb or expand the memory. Adding ram looks doable. A cartridge can page out the OS roms, from what Ive read, but i haven't seen pinouts for the cartridge port yet. It looks like the bottom 48k could be ram, and a tiny 8k os on a cartridge can go at 0xC000. Since there is no precedence to follow, the sky's the limit! The games are fun to play but as others have stated they play very slow. Neat little computer that's very rare. I found one game in the wild for it once at an electronics recycling drop off. I own a complete US set and a few of the Japan only games. I should break it out again. I managed to get the F18A into the Tomy Tutor. 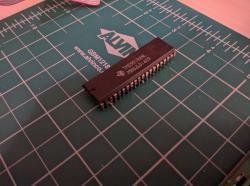 I needed to unsolder the TMS9918A, and any of the capacitors on the DRAM that were physically obstructing. 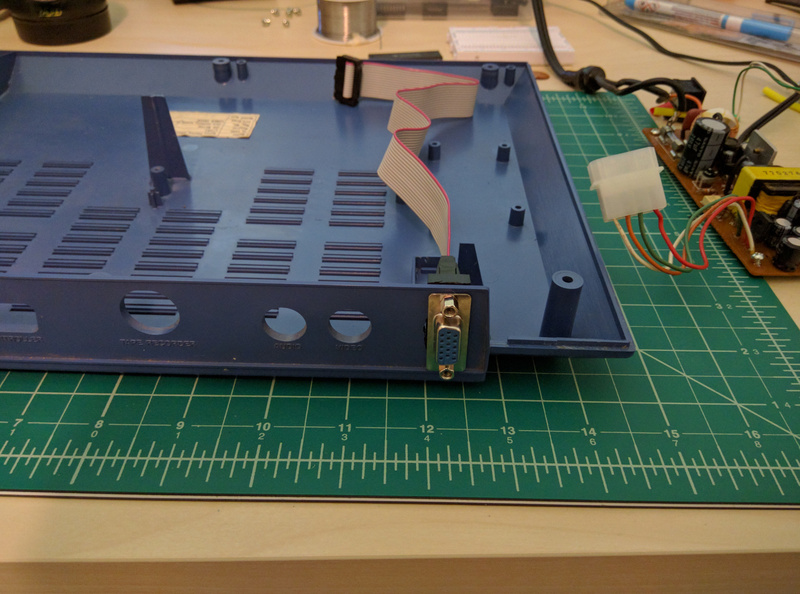 I also desoldered the wires connecting the RF modulator / TV out from the board. 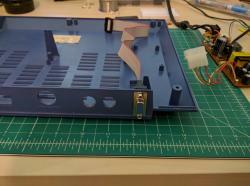 Once this is done, the +12v from the power-supply is not needed at all. My keyboard is still not 100%. I used silver conductive paint and recovered 14 of the 16 keys that were failing. However I lost the space bar and '>' along the way. This will just require patience. Edited by jedimatt42, Thu Oct 13, 2016 12:09 AM. I actually just saw one of these machines at a thrift store a couple of days ago, but it was priced at $350. Pretty cool Matt. I'm kind of afraid to try and put an f18 in one of my Tomys due to the need to unsolder the 9918. It will be interesting to see if you come up with any mods for this computer. So, Sega Genesis 3 button controllers are just so versatile... 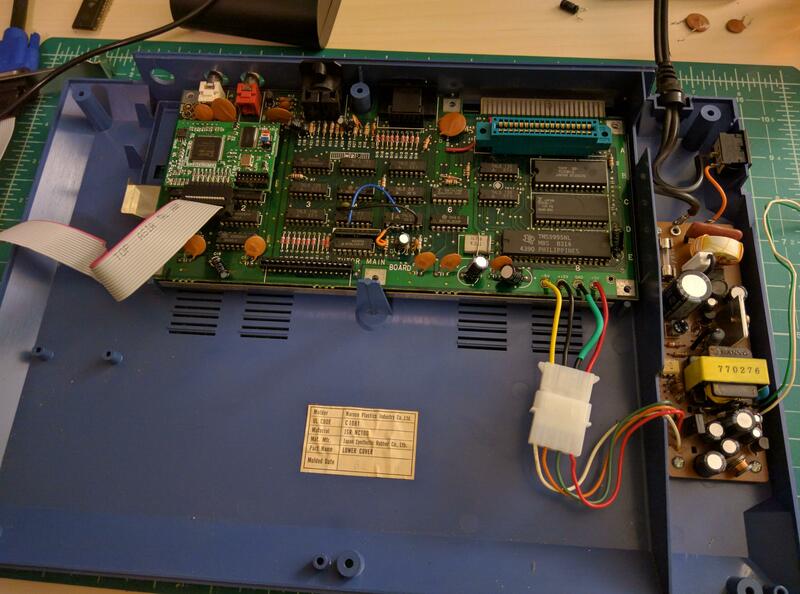 I picked up one at PRGE for a few bucks, pulled all of the discrete components and the encoder chip off of the board, and then wired the gamepad up for player 1. The tutor has 2 button controllers, and I only had the bare console and cartridges... So I had to do something... Sorry Genesis. The inside of the Genesis controller had the pin numbers printed on the board, I don't know if the colors hold up from instance to instance. The buttons and directions already all have a 'common' trace on the pcboard. That serves perfectly for 'player1'. After that, it is just a matter of tracing the function to a thru-hole on the board, and soldering the wire for that function in place. Lather rinse repeat. I've reworked PC gamepads for similar purposes. I have access to a whole box of unwanted gamepads, so plenty to experiment with. Good call on the Genesis controller. I'm going to build an adapter to use a colecovision controller for my Tomys. I believe I have correctly mapped the keyboard matrix pinout for the US Tutor. I will hopefully get one of my USB keyboard adapters reprogrammed for this matrix and in there soon. I managed to steal a few cycles this weekend and drive the keyboard matrix from a Teensy 3.2 microcontroller. But the interrupt response time is to slow on the Teensy to keep up. Brute force polling was better, but insufficient to get a clean transition from one key to the next. I'm planning to go upstream from the keyboard matrix to the key selector logic (an LS138 & LS251), and let the microcontroller assert a couple 'pressed' keys to some GALs programmed as 6 bit daisy chainable comparators. Connecting 2 6 bit comparators to the 3+3 bits for the matrix, should allow support for 2 simultaneous key presses without having to respond to any pin transitions from the Tomy side. It is an idea... untested at this point.